“Versiones Acústicas” translates into English as “Acoustic Versions”. 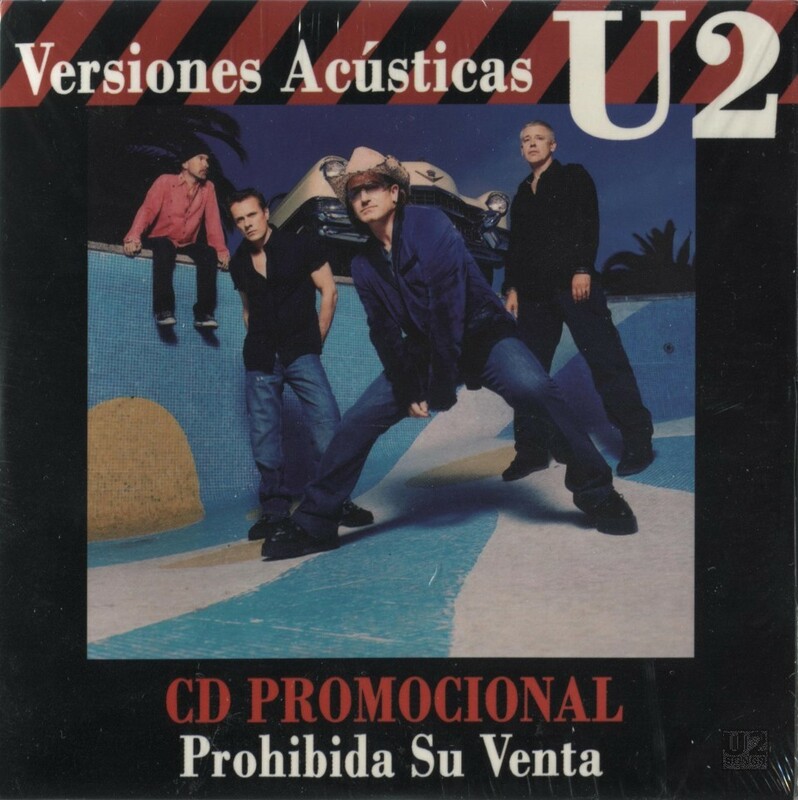 This was a special promotional CD that was pressed in Columbia, and distributed in Columbia, Venezuela, Ecuador and Peru. The CD contains two tracks, in a unique card sleeve. The CD was released in 2005 in limited quantities. The two tracks contained on this album are “Sometimes You Can’t Make it On Your Own (Acoustic)” and “Vertigo (Temple Bar – Acoustic Version)”. Both of these are unique to this release and have not been released in audio format elsewhere. However, that being said, both of these tracks were released in video format on the DVD that was released with “How to Dismantle an Atomic Bomb” in deluxe releases called “U2 & 3 Songs”. That DVD contained a number of videos, and these two acoustic versions were included. If you need your memory refreshed, think back to watching The Edge perform “Vertigo” on a banjo – that is the version that is here in audio. “Sometimes” is full length here 4:45. “Vertigo” is edited to 2:55 from 3:11 on the DVD. It removes some of the audio silence at the start and end of the track on the DVD. The tracks here appear to have been ripped directly from the DVD and then edited for length. The rip from DVD is poorly done. The culprit is likely a poor sample rate conversions. DVD audio is 48 kHz PCM and CD audio is 44.1 kHz, so to burn a CD from a DVD rip, you have to convert the sample rate. Windows XP’s built in sample rate conversion algorithm was absolutely horrible, and produced exactly the tinny sound that is heard on this CD. My guess is that whoever “produced” this CD ripped the audio from the DVD and then burned it straight to CD with Windows Media Player in the production of these tracks.